Some of you may have come into this fantastic world of writing by a logical path; you aced junior high grammar, paid close attention to high school composition instructors, earned degrees in creative writing, and then wrote your first novel. For the rest of us, the whole experience has more closely resembled a headfirst dive into Alice’s rabbit hole. I started writing fiction on the internet in the mid-’90s, and went to work on my first novel a few years later. Between the time I saved chapter one of “Book One” on my laptop in 1997 and this past year when I signed my twentieth book contract, I learned lessons in ways I wouldn’t want to repeat. I’m still learning lessons daily, but few of them leave as many bruises as those first dozen or so. One thing I discovered is that we, as writers, tend to share too much information. I don’t mean about ourselves, necessarily, but about our works. When someone asks what you’re working on, they are rarely looking for a detailed outline of your novel. They expect a sentence or two. A paragraph at most. This is especially important to know when the person asking is an editor or agent. In the same way that you’d never start a pitch to an editor with, “My main character, George, was born in Albuquerque, New Mexico, where he had a normal childhood, even though his father was a little strict, and when he was eighteen, he left for college…,” you don’t want to start your book with everything there is to know about your characters. One of the joys of reading is discovering the hidden parts of a story, the delicious history that motivates characters to do what they’re doing. If you reveal all up front, there are no surprises left, and readers will quickly lose interest. But loading a manuscript with backstory is natural. We’re excited about our new story; we want to explain everything right away. The tough part—the part that comes with experience—is recognizing backstory and knowing what to remove. Was George convicted of killing his college roommate because he was framed by another student who thought George had witnessed a major drug deal? Don’t tell me in chapter one that George is innocent. Maybe you don’t even want to tell me that George was in prison. Let me guess why he won’t answer questions about his past. Make me worry about Susan when she’s alone with him. You’ll keep me interested. Equally as important as knowing that you must sprinkle backstory throughout your book, is understanding how to do it. Less is better, and showing is better than telling. Are you ready to divulge that George was in prison? (Disclaimer: I’m not saying this is great writing. These are only examples.) “Metal bars clanged into place. George bolted out of bed, his hands clenched into fists and his heart racing,” will be more effective than telling me, “George had spent fifteen long years in San Quentin. Even after all this time, he still woke to the horror of the door sliding shut on his cell.” While there’s nothing technically wrong with the second excerpt, it lacks the feel of action of the first one. We, as writers, not only want to tell you everything about our characters, we also want to use all our wonderful research. If George grew up in Albuquerque, would he really be thinking about the fact that Sandia Crest is 10,678 feet high as he’s driving around town? Or that the population was 535,239 in 2010? That would be a little absurd, wouldn’t it? But maybe he would tell Susan, a newcomer, that Sandia is always on the east side of downtown, or that the city is home to about a half-million people. If your character doesn’t have a reason to consider something, don’t force it on your readers. They won’t appreciate it. The first editor I spoke to about my first manuscript told me my story started in chapter eight. I was hurt and horrified, but realized before long that she was right. I had way too much backstory and no action in the beginning of the book. I feel better now when my own first edit is full of red ink where I’ve sliced away all that extra information. My advice to relatively new writers? Question every line; be brutal with the red pen. There’s nothing more wonderful than putting together a page turner. And practice a one-paragraph pitch. You never know when you’re going to run into an editor or agent who is looking for your book. Good luck out there, and enjoy the next Mad Hatter’s tea party. Sarah H. Baker is the author of more than 20 novels, with publishers ranging from Kensington to Harlequin to small presses. She holds an MS in engineering and works full time, but also writes fiction under three pen names: S. H. Baker, Sarah Storme, and Lydia Parks. The first book in her Dassas Cormier Mystery series, Murder in Marshall’s Bayou (Zumaya Publications, 2009), was recommended for an Edgar Award. 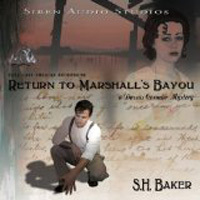 Return to Marshall’s Bayou (Siren Audio Studios, 2010) is the full-cast audio version of this first mystery and was a finalist in the Audie Awards. Sarah enjoys sharing her experience with other writers and teaches courses for the University of New Mexico’s Continuing Education Department. Visit her at shbaker.com. This article was originally published in the September 2012 issue of SouthWest Sage and is reprinted here by permission of the author.